It can be the perfect gift for the fans of Despicable Me 2 and the lovers of Minions. This is the set of 6pcs keychain of mini action figures that has 3D characters action figure. It is made up of high quality plastic with the height of 1.5 inches. 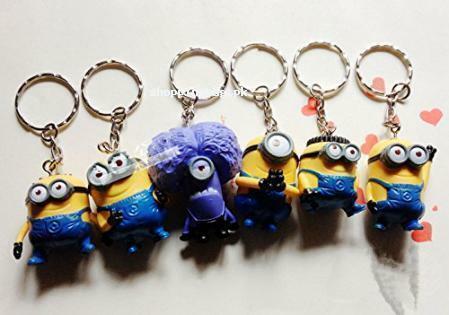 You can shop this 6pcs of keychain of Despicable Me 2 mini action figures now at your doorstep with the exclusive facility of cash on delivery. This is the rare set of keychain that you can find in our online collection. Explore and find more quality products in our online collection imported from Amazon to shop online in Pakistan. This Despicable Me 2 mini 3D action figure keychain set of 6pcs is here for the sale in Pakistan to shop online with cash on delivery offer.